The R255SMS package is the ultimate tool on the job site. Accuracy, power and reliability at the forefront of its design, this 10In. sliding compound miter saw is equipped to power through 4 x 4 inch posts, hardwood, laminate, nail embedded wood and even 1/4In. thick mild steel with precision, perfect for any contractor or home workshop. Cut steel, aluminum and even wood with embedded nails. MAX. Cross cut 11-13/16In. x 3-9/16In. Smooth square cutting every time. Ensuring accuracy and increasing productivity. Make angled adjustments accurately and easily. when cutting mild steel; increasing safety. no heat & no burrs. For cleaner and safer working environment. 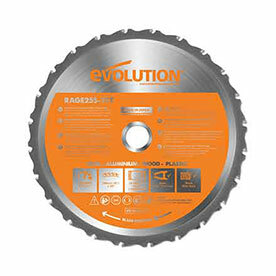 With the Evolution Diamond blade (sold separately). Accurate cutting with 11-13/16 inch sliding functionality, adjustable depth of cut and laser precision guidance. Smooth, square, reliable cutting every time in a variety of materials. Cut mild steel with no heat, no burrs & virtually no sparks. Powerful 15A hi-torque, optimized gearbox and blade system increases motor and blade life to cut through a variety of materials with ease. Perform accurate Cross cuts, Miter cuts, Bevel cuts and Compound cuts with adjustable precision settings. Cut to within +/- 0.5˚ with 0° - 45° bevel tilt and 50˚ - 50˚ mitre angles with quick click miter stops at 0˚, 15, 22.5, 30, and 45˚ both left & right. An impressive 11-13/16 x 3-9/16 inch max. cross cut capacity enables you to cut 4 x 4 inch posts. Ambidextrous, ergonomic, horizontal trigger with comfortable grip combats repetitive strain. Compatible with Evolution's Mitre Saw Stand, giving you full control to cut accurate repeated lengths on wide and long materials with ease. The Evolution 10In. Diamond blade can also be fitted for cutting ceramic tiles and ornamental stone, (sold separately). Max. Cross Cut (0° x 0°): 11-13/16In. x 16In. Max. Bevel Cut (0° x 45°): 8-1/4In. x 3-9/16In. Max. Miter Cut (45° x 0°): 11-13/16In. x 2In. Max. Compound Cut (45° x 45°): 8-1/4In. x 2In. Product Dimensions: 14- 3/16In. x 27-3/4In. x 28-47/64In. Packaging Dimensions: 22-1⁄4In. x 14-3⁄8Inb. x 20-15⁄32In. Non-Ferrous Metal Aluminum, armoured cables, cable tray, copper, floor edgings, roof flashings, stair nosings. Evolution has re-invented the way to pack a mitre saw. 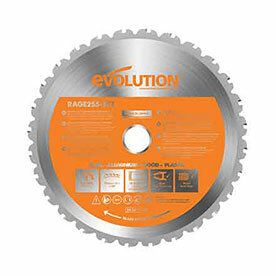 Here is just a few reasons why Evolution “Flat-Packed” miter saws are better. Compared to a fully assembled 255mm sliding miter saw packaging, the box size has decreased by 40%. This makes it even easier to carry and fit in your vehicle. Will it cut thicker than 1/8” (3mm) mild steel plate? The arbor size of the R255SMS is 1In. All Rights Reserved by Evolution Power Tools Ltd.